South Korea, an East Asian country on the southern portion of the Korean Peninsula. It’s known for its green, uneven wide open spotted with cherry trees, blossoms. With hundreds of years old Buddhist sanctuaries also worth a vist. In addition to its waterfront angling towns, sub-tropical islands, and innovative urban areas, like Seoul, the capital. Split by a fearsome outskirt, South Korea offers the voyager an amazing scope of encounters, delightful scenes and 5000 years of culture and history. Seoul, known for its green, uneven wide open spotted landscapes with cherry trees, blossoms, and hundreds of years old Buddhist sanctuaries and Temples. In addition to its waterfront angling towns, sub-tropical islands, and innovative urban areas, like Seoul, the capital. A stuffed date-book of celebrations and occasions implies there's quite often a festival or something to that effect to go to wherever you are. It may be Boryeong for its mud festival or Gwangju for its Biennale or its yearly salute to that most Korean of nourishment, kimchi. UPON ARRIVAL AT INCHEON INTERNATIONAL AIRPORT, TRANSFER TO HOTEL VIA SIC, FREE TIME ON YOUR OWN LEISURE. OVERNIGHT AT HOTEL. BREAKFAST AT HOTEL. FREE TIME FOR YOUR OWN LEISURE UNTIL TRANSFER TO AIRPORT VIA SIC FOR DEPARTURE. Hotel Galaxy is located in Pohang-si, Gyeongsangbuk-do and it is a new concept business hotel. The hotel is doing its best to realize customer satisfaction by offering such services as hi-speed internet, wifi access, direct-dial international calls, and interpretation service, the services only featured in first-class hotels, at a reasonable price. 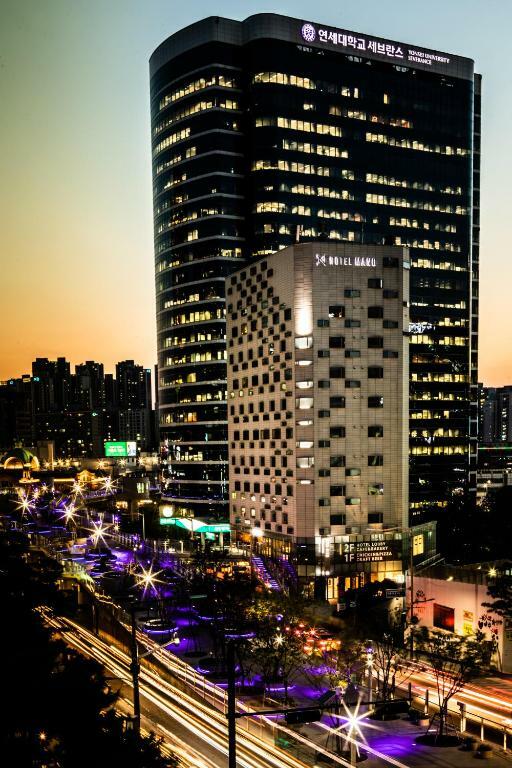 A 5-minute walk from historic Namdaenum Gate (Sungnyemun), this relaxed, modern hotel in a contemporary tower is a 4-minute walk from Seoul Station, offering train service to Gyeongbokgung Palace. Streamlined rooms have free Wi-Fi, smart TVs, and minifridges, plus tea and coffee making facilities. Family rooms add extra beds and living space. There's a casual, international restaurant with floor-to-ceiling windows; breakfast is available for a fee. Additional amenities include a gym, and a spa area offering massages and wellness treatments. Featuring free WiFi, Golden Tulip M Hotel offers accommodations in, just 9.7 km from Jamsil Sports Complex. Guests can enjoy the on-site restaurant. Free private parking is available on site. Each room at this hotel is air-conditioned and is fitted with a flat-screen TV. Every room comes with a private bathroom. Extras include bathrobes and slippers. You will find a 24-hour front desk at the property. The nearest airport is Gimpo Airport, 16.1 km from the property. Once paid and confirmed, Cancellation and/or Transfer of Package is not allowable. A No Show will forfeit your Trip and No Refunds are permissible. 5 starsHad a great winter package tour in Korea with Legends Express Travel Services. Gained some friends and all were treated as one big happy family during the tour together with Sir Steve, Ms Joy and Brandon. This one is excellent, from hotel accommodations, meals, tours, English speaking guide, bus driver and photographer. Truly satisfied and enjoyed everything from day 1 to 5.